World's Smallest And Lightest Battery Charger | OhGizmo! I have a lot of devices that run on AA batteries. Namely my mouse and gaming controllers, but there are others around here that need them as well. This of course means that I have a few different chargers throughout my house to ensure I’ve always got a fresh pair somewhere. If you also need rechargeable batteries on the go, I might recommend tossing this Freeloader Battery ChargerPop into your bag. It claims to be the smallest and lightest battery charger in the world, which is always nice for a laptop bag. 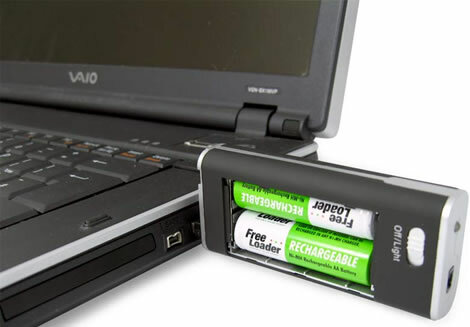 It will charge either two AA or AAA batteries to 75% of a full charge in three to four hours via your PC’s USB port. For $25, it probably wouldn’t be a bad addition to your gadget bag, provided your gadgets actually use AA batteries. This may look like a good idea but really it’s not. The problem is that 2 AA batteries weigh more then a USB port can properly support. I found that any movement or vibrations transferred through the usb port would cause the charger to wiggle loose. The more I used the charger the worse the connection became till the point that It was not working anymore. It was a cool idea but the product wore out before I could even use it 5 times.